Denise Barry Sensei began her journey on the Aiki Path in March of 1977. She was not looking to participate in the martial arts and had never heard of Aikido as it was just finding it’s footing in the United States at that time. She immediately knew that the principles and practices of Aikido held very important life lessons. She experienced Aikido when a local instructor arrived at her High School to give her class an introductory session (see her essay for more details on this profound experience) of Aikido. She has been walking the Aiki path in an unwavering manner every since. She began her studies at Aikido of Tamalpais in Mill Valley, CA. Soon afterward; she began splitting her training time between Tam Aikido (as it was called) and Aikido of San Francisco. The instructors at Tam Aikido were Richard Strozzi Heckler Sensei (Two Rock Aikido), Wendy Palmer Sensei (Tam Aikido) and the late George Leonard Sensei who, along with Michael Murphy, was widely considered to be one of the founding fathers of the Human Consciousness Movement. They were all primary students of Robert Nadeau Shihan. Nadeau Shihan was privledged to have studied with the founder of Aikido, Morihei Ueshiba (O’Sensei). Nadeau Shihan was the founder of Aikido of San Francisco. He shared the teaching with Frank Doran Shihan and Bill Witt Sensei. Additionally, Terry Dobson Sensei arrived in the Bay Area and taught at both dojos. Denise Sensei studied in depth with Dobson Sensei while he was here and prior to his passing in 1992. Dobson Sensei was a live in student of O’Sensei (Uchi Deshi) in Japan for 10 years. Mitsugi Saotome Shihan, also a long time student of O’Sensei, traveled to the Bay Area annually and was a very important figure in the transmission of both the spiritual and technical aspects of the Art. His influence in Denise Sensei’s Aikido development is significant. In 1980, Denise Barry Sensei traveled to Boulder CO to spend some time studying with Hiroshi Ikeda Shihan. Ikeda Shihan is a direct student of Saotome Sensei and has also been instrumental in the forging of Aikido in the Bay Area. In 1990, she finally (after trying for at least 10 years) met Mary Heiny Sensei. Mary Heiny Sensei was one of very few high ranking women in Aikido. She met and experienced O’Sensei in a profound way while studying Japanese in Japan. This experience altered the course of her life and she returned to Japan to study with him in the year prior to his passing. Following his passing, Mary Sensei went on to study intensively with Hikitsuchi Sensei in Shingu Japan. Hikitsuchi Sensei was also a primary student of O’Sensei. This 1990 meeting with Mary Heiny Sensei was the beginning of a very important relationship that is still going strong today! Kuma Kai Aikido would probably not exist today if it were not for Mary Heiny Sensei. She not only encouraged Denise Barry Sensei to open her own dojo, she helped with the naming as well. She is considered the Grandmother of Kuma Kai Aikido and we are fortunate to have her guest teaching us several times per year. Kuma Kai Aikido is an active member of the California Aikido Association and was under the direction of Frank Doran Shihan for 20 years. 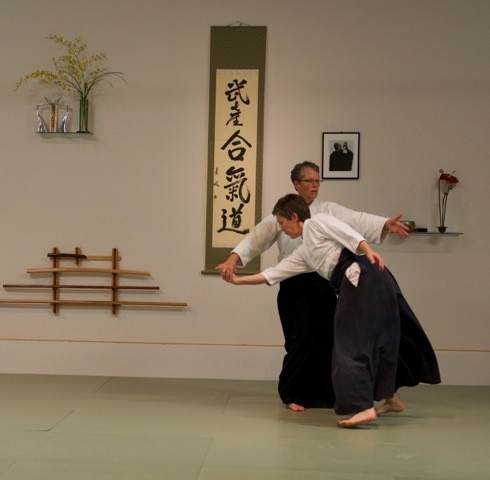 Doran Shihan has been instrumental in the development of Aikido in the Bay Area and internationally. He is a master teacher who has devoted his life to furthering O’Sensei’s vision of world peace. Much of Denise Barry Sensei’s technical and flowing influences come from Doran Sensei. Denise Barry Sensei has earned a blue belt in Ju Jitsu and has trained in Tai Chi, Qi Gong and Capoiera. She has developed Aikido programs in after school programs, programs for emotionally disturbed youth, Montessori and Waldorf programs and programs for probation and youth offenders. She was instrumental in the development of the Children’s Program at Centerfield Aikido for 7 years. Denise Barry Sensei feels very fortunate to have been mentored by so many devoted and talented instructors. She feels even further blessed to be the recipient of O’Sensei’s teachings as transmitted to her by his direct students. Her original and root teacher in her journey is Robert Nadeau Shihan. O’Sensei took a special interest in Nadeau Sensei in part because he liked the kinds of questions he asked. Nadeau Sensei has devoted his entire life to Aikido and to understanding the more esoteric aspects of O’Sensei’s teachings. This includes the spiritual, psychological, energetic, dimensional and daily life aspects of this profound Art. She has not only had the opportunity to study in depth with Nadeau Shihan, she has had the privilege of traveling with him as his personal assistant to both Europe and New Zealand. Denise Barry Sensei has recently been honored with a promotion to the rank of 6thDegree Black Belt by Hombu Dojo in Japan. This promotion was granted at the recommendation of Robert Nadeau Shihan. We are currently active members of Division 3 under the direction of Robert Nadeau Shihan. Denise Barry Sensei serves on the teaching committee of the California Aikido Association and teaches both domestically and in Europe and New Zealand.